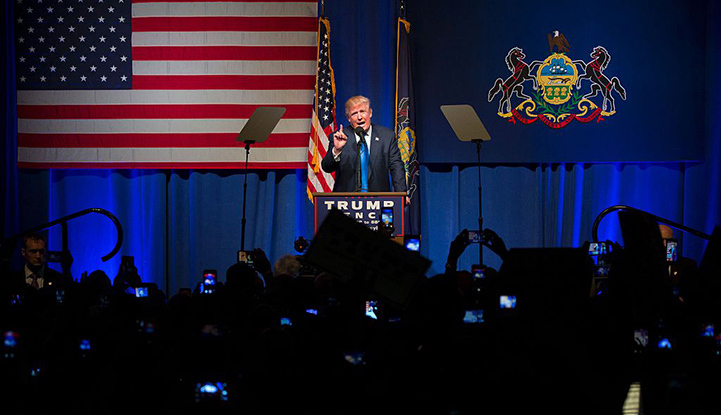 Republican presidential nominee Donald Trump speaks at a rally at Lackawanna College in Scranton, Pennsylvania. December 1, 2016 -- Donald Trump won the presidency with support from an overwhelming majority of U.S. counties where median household income has grown most rapidly over the last generation, according to a MapLight analysis of U.S. Census and elections data. Trump won 89 of the 100 U.S. counties with the most growth in household wages and salaries since 1979. Nationwide, the typical American county lost 2.6 percent of real household income during that period. The data indicate that while many Trump voters may have felt economically pressured, their financial concerns often may have been based more on perception than reality. The Trump victories included majorities in wealthy suburbs, such as Hunterdon County, N.J., a New York City exurb where the median household makes more than $106,000; St. Johns County, Florida, where income has climbed 41.5 percent since 1979; and Forsyth County, Georgia, an Atlanta suburb that was wholly segregated until the mid-1980s. Most of the economically improving counties won by Trump were in rural America, with heavy concentrations in the Dakotas and Texas. Overall, Trump won more than 84 percent of U.S. counties, including the vast majority of inland counties. His support over a wide geographic area was key to his Electoral College success. Meanwhile, Democratic nominee Hillary Clinton is winning the popular vote by more than 2 million ballots. Her victories were concentrated in economically robust counties in large coastal cities. People living in Manhattan, the cultural and financial center of the U.S., have enjoyed a 58 percent rise in household incomes over the last generation; they gave 87 percent of their votes to Clinton. On the other coast, Clinton took 86 percent of the vote in San Francisco, where incomes have risen 52 percent since 1979. The former secretary of state also took more than 90 percent of the vote in Washington, D.C., and more than 75 percent in Arlington, Alexandria and Falls Church, a trio of its northern Virginia suburbs, where household incomes have risen since the midpoint of Jimmy Carter’s administration. In general, Clinton outperformed Trump in large cities across the country, winning 22 of the 25 counties that recorded the greatest number of votes. Among those population centers, Trump only recorded victories in Maricopa County (Phoenix), Ariz.; Tarrant County (Fort Worth), Texas; and Suffolk County (Long Island), N.Y. Among counties with more than 500,000 voters, Clinton won all 10 of the hardest-hit ones, ranging from a 67 percent victory in Wayne County, Mich., which includes Detroit and which lost 31.8 percent of its household income over the generation, to Clark County, Nevada, where she took a 54 percent majority mostly among Las Vegas voters who have lost 11.8 percent of income since 1979. The election was essentially determined in three Rust Belt states that had been viewed as uphill struggles for Trump: Michigan, Pennsylvania and Wisconsin, which carry a total of 46 electoral votes. If Clinton had won all three, she would have become the nation’s 45th president; instead, she lost all three, by less than 98,000 votes. According to exit polls, about 60 percent of all voters in the three states thought the economy is in bad shape. Yet Trump took an overwhelming number of votes in counties where, according to Census data, household incomes have improved since 1979. Trump won all 13 Michigan counties where real wages and salaries have risen over the last generation, with a margin in those counties of nearly 33,000. He won Michigan’s 16 electoral votes by less than 11,000 ballots. In Pennsylvania, Trump won the state’s 20 electoral votes by roughly 64,000 votes. There are 22 counties where household incomes have improved over the last generation; Trump won 17 of them, by a combined margin of 160,000. The story was similar in Wisconsin, where Trump managed a 22,000 margin to take the state’s 10 electoral votes. Forty of the state’s 72 counties have seen an improved income picture since 1979; Trump won 34 of them, by a combined margin of about 102,000. MapLight analysis of presidential election results data from multiple sources, collected from Nov. 22-30, 2016; 1980 Census; and 2014 American Community Survey, five-year samples. Because of use of preliminary totals and potential recounts, data may fluctuate.